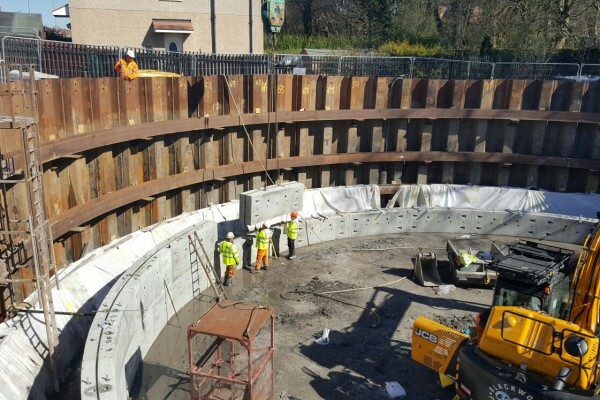 With a responsibility to protect homeowners and properties, Scottish Water needed to make changes to the sewer system in Glasgow to reduce the risk of flooding following heavy rainfall. 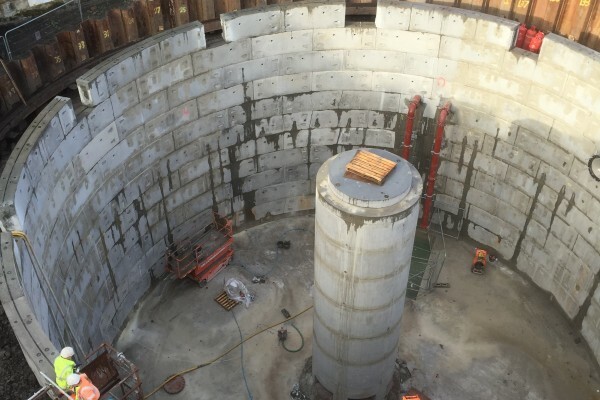 Specifically; the construction- through shaft sinking– of a 20 metre diameter by 20 metre deep water retaining structure with a storage volume of over 6000 cubic metres for excess surface water runoff. 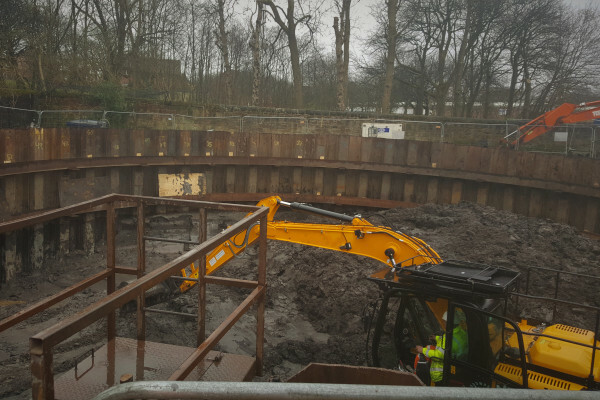 The Avonspark site posed particular difficulties, with lots of rock at depth, as well as peat and alluvial silt present down to depths of 6m, making this an incredibly treacherous undertaking. Further complicating proceedings was the close proximity of residencies, less than 10 metres from site, making community relations/outreach a priority. 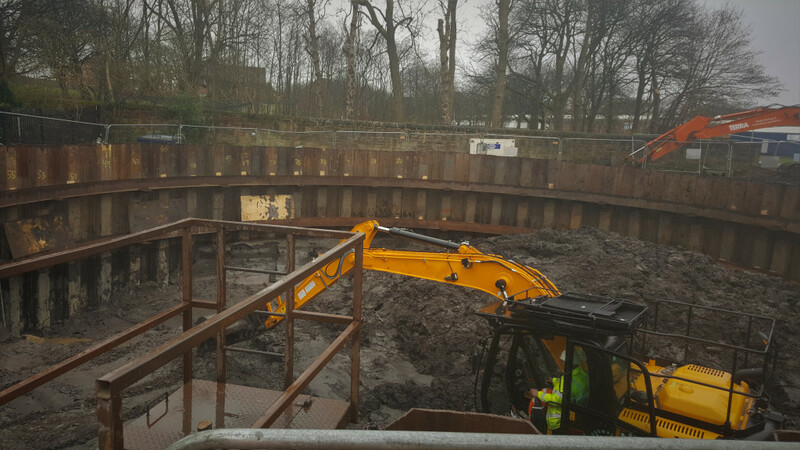 The presence of peat, silt & clay with low SPT values meant that underpinning could not commence from ground level. 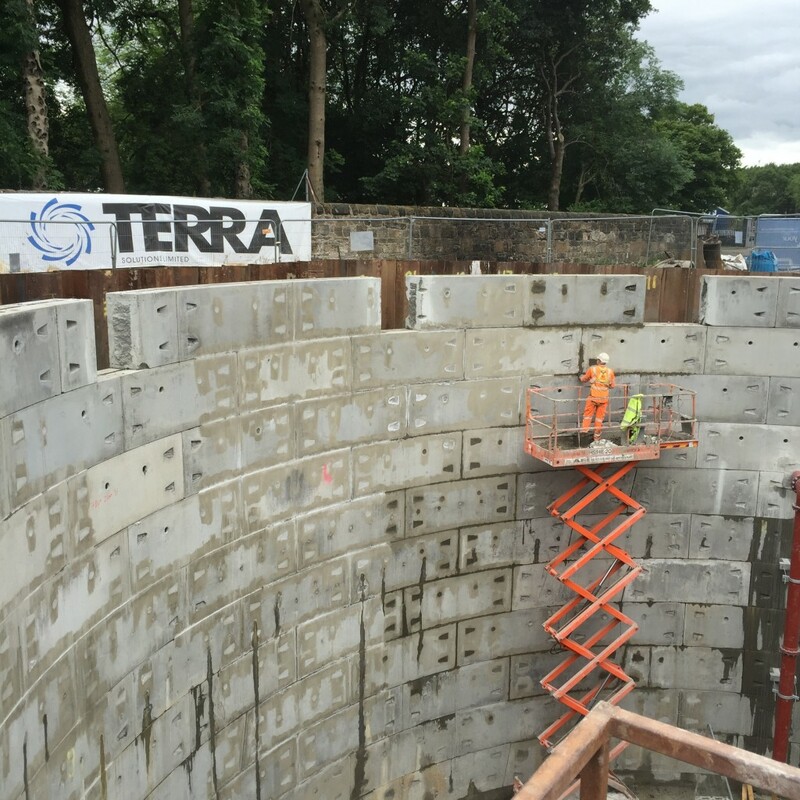 T, Terra Solutions determined that construction of a cofferdam would be necessary. 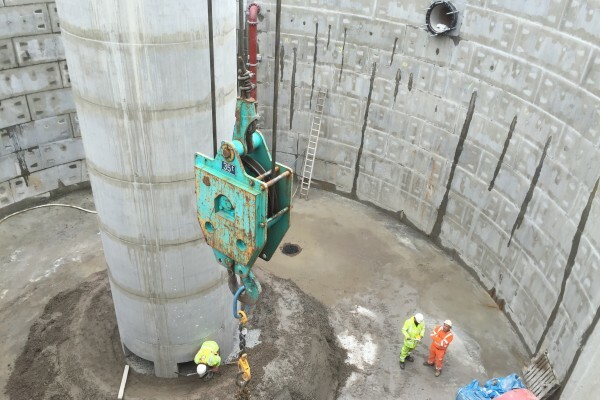 As such, a piling mat was established and tested. 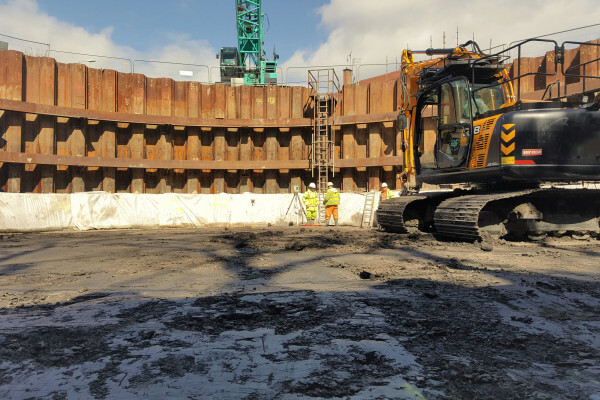 Using a vibration-less hydraulic press rig, 138Nr by 8m long sheet piles were driven into the ground to form a cofferdam. 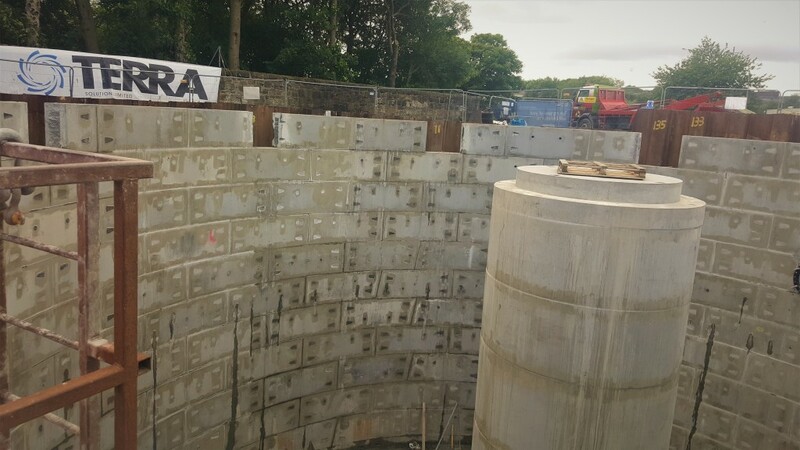 This provided not only structural stability for shaft sinking, but served a dual purpose, acting as a cut off wall for groundwater ingress. With piling completed, excavation could begin. 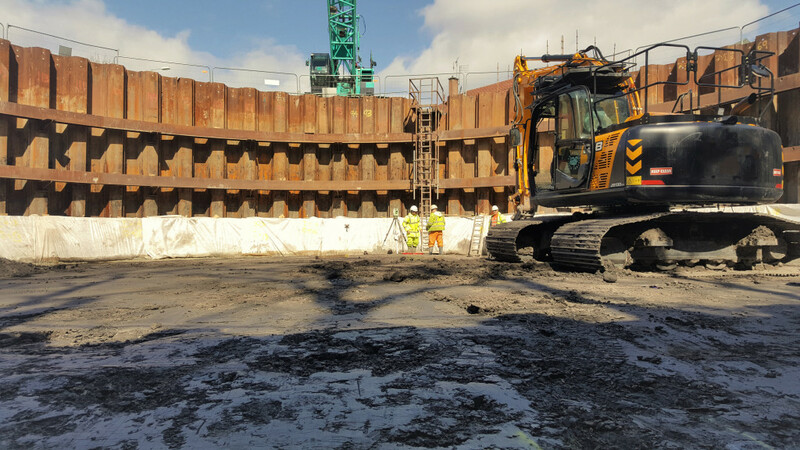 It was ensured that excavation took place evenly, so as not to present any abnormal patterns that may have overloaded the cofferdam. With the piles in place the collar could begin to be constructed. 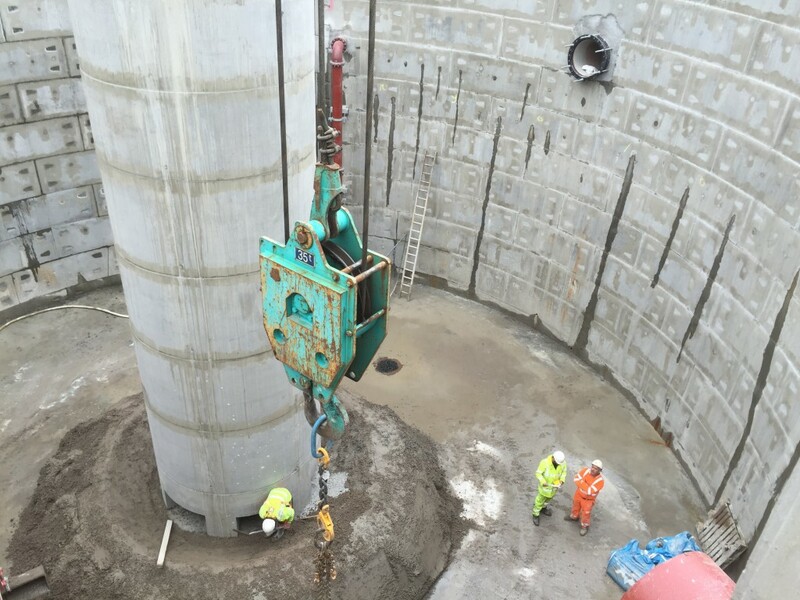 A 1.5m x 2m RC collar was constructed using prefabricated steel cages and over 230m3 pumped tight to the sheet piles. 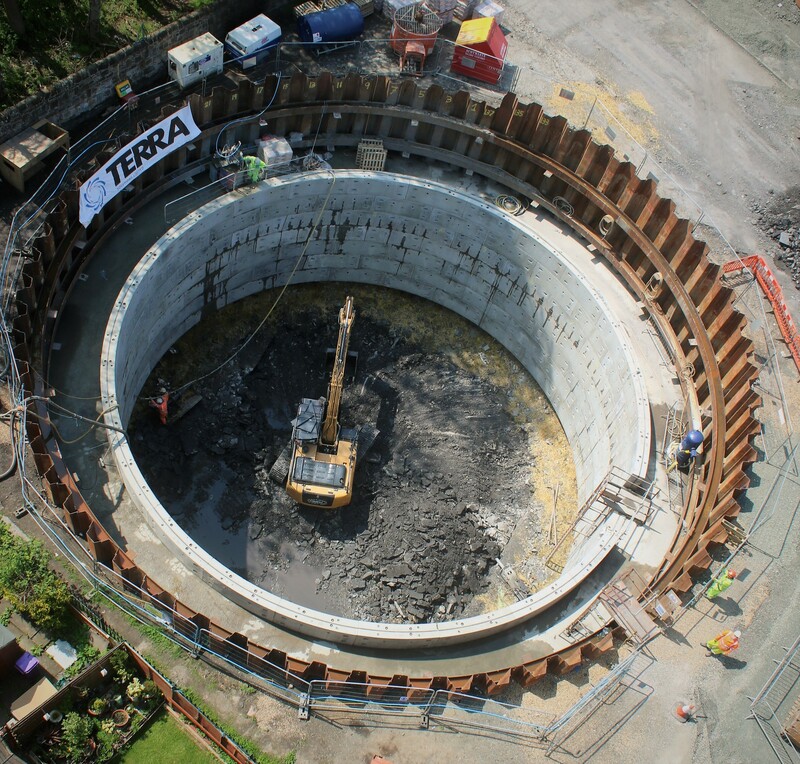 The shaft required careful excavation with the presence of sandstone with strengths of up to 60MPA. 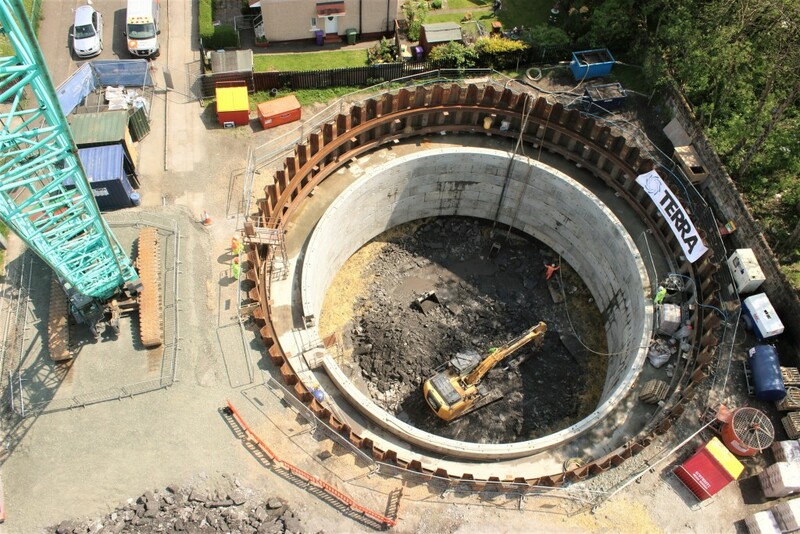 As such the collar was installed to formation using the underpinning technique, once this was completed a 2m base was installed using over 600 cubic metres of reinforced concrete. 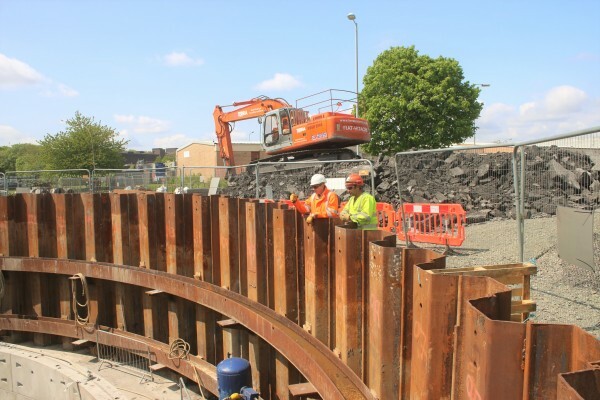 The steel for this was installed in prefabricated sections, reducing installation time by half. 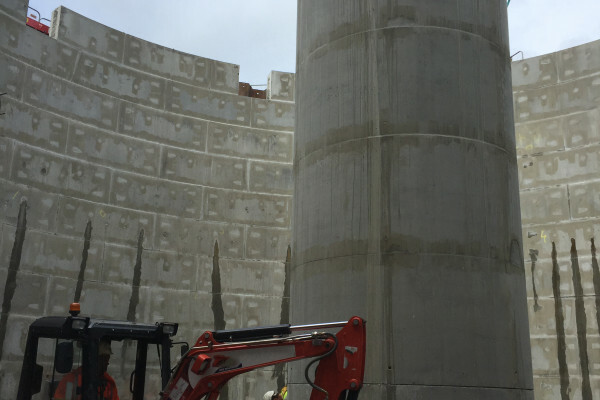 After completion of the base the Vacuflush Column could be constructed from precast units weighing 13 tons each. This was then sealed with non-shrink grout. 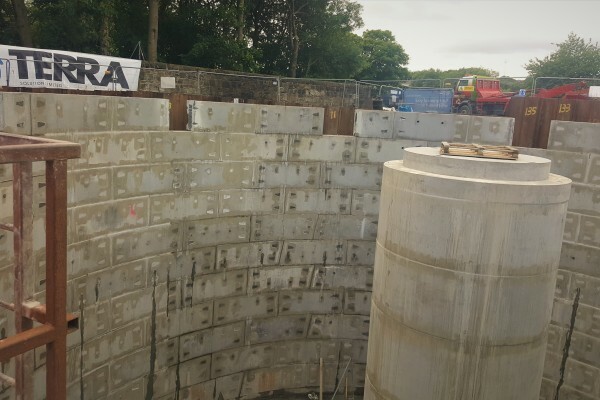 Once the connections to the tank were installed and thoroughly tested, the cover slab- which was made up of 10Nr 13T beams and other precast sections could be installed. 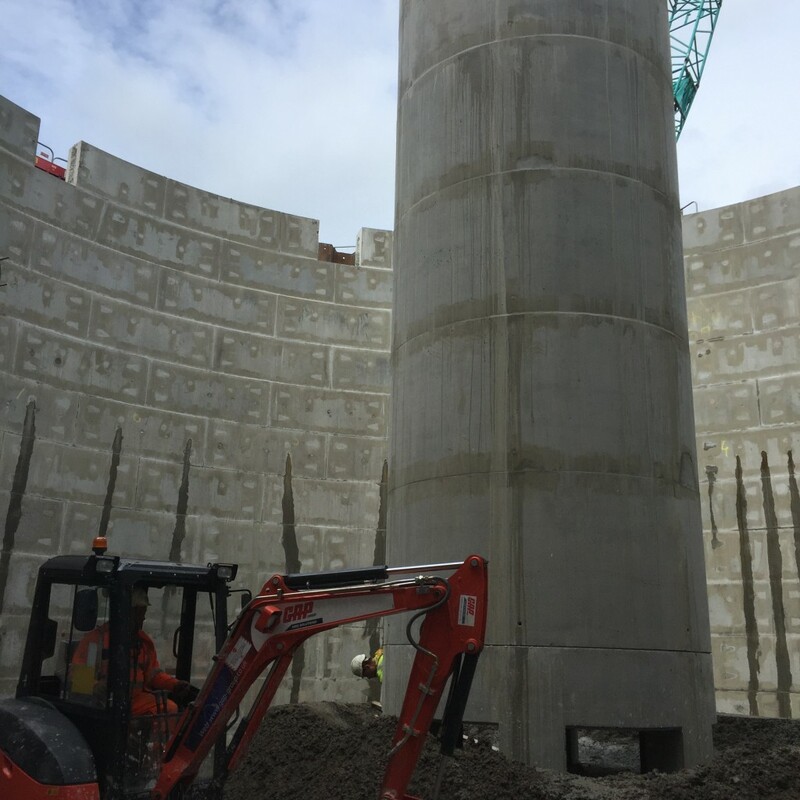 After this stage the ground was made up to its new level. 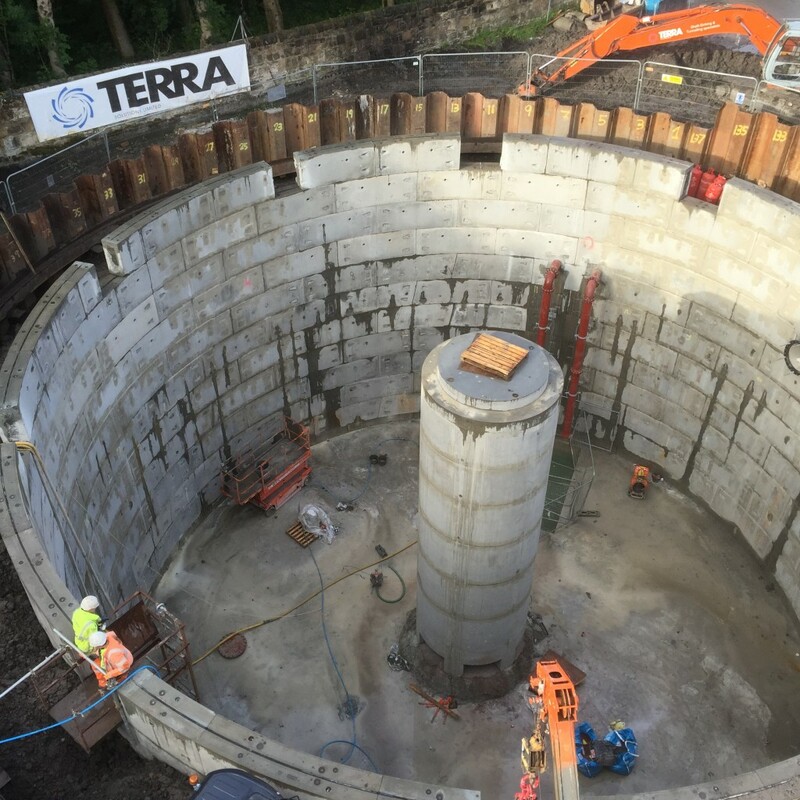 The Avonspark Street Storage tank and Pumping Station Shaft were completed successfully whilst ensuring the health & safety of all personnel on site. 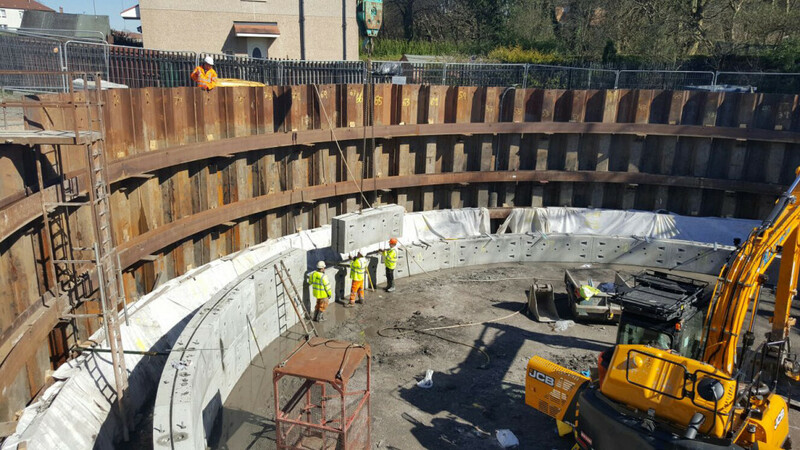 Careful planning meant that work was completed effectively, efficiently & to the required high standards of quality expected from our client. 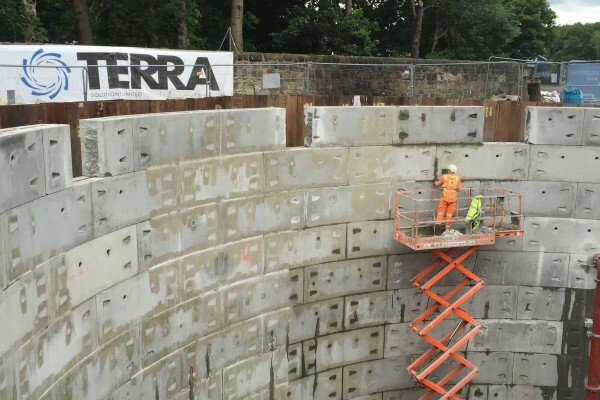 The professionalism of Terra staff also extended in this instance to community forums, assuring them of the benefits of this undertaking and the security of their homes.